I'm moving right along with Harry Potter and the Prisoner of Azkaban. 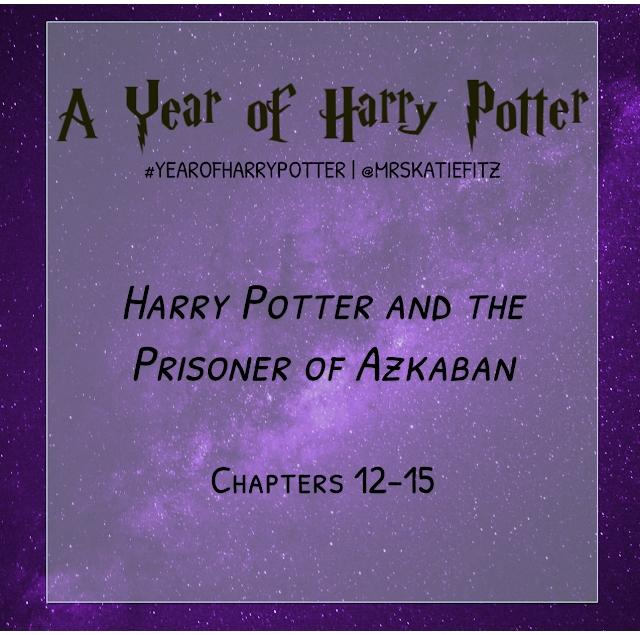 Last week, I read Chapters 12 to 15: "The Patronus," "Gryffindor Versus Ravenclaw," "Snape's Grudge," and "The Quidditch Final." Spoilers ahead, as always. One nice thing about re-reading this series is getting to see all the supporting characters enter the story with a new appreciation for their significance. In this book, we meet Cedric Diggory and Cho Chang through Harry's interactions with them on the Quidditch pitch, but for re-readers who know their role in the later books, the first moments they appear are heartwarming (and in Cedric's case, heartbreaking!) I also really enjoyed Oliver Wood and Lee Jordan in these chapters - both are written with great humor. Another thing that is standing out to me in this book is how scary the dementors are! In my mind, the first three books of the series are the "tame" ones, but really, I'd be a little nervous about letting a little kid read about these soul-sucking beings. My kids are pretty unflappable, but dementors are intense! I also took note of a moment where, despite my loyalty to Harry, I felt a little sympathy for Snape's point of view. On page 209, he says, "Everyone from the Minister for Magic downwards has been trying to keep famous Harry Potter safe from Sirius Black. But famous Harry Potter is a law unto himself. Let the ordinary people worry about his safety! Famous Harry Potter goes where he wants to, with no thought for the consequences." Harry definitely has this attitude throughout the series. The worst of it hasn't even come yet, so it's understandable why Snape just doesn't have patience for him. Another moment I loved is a quick awkward glimpse into the slowly developing romance of Ron and Hermione. When they get the news that Buckbeak is to be executed, Hermione gives Ron an unexpected hug, and he reacts by patting "her very awkwardly on the top of the head." Poor clueless Ron. He will always be my favorite. Finally, I think some of the best writing of the series so far is in the chapter about the Quidditch final, in which Gryffindor finally wins the Quidditch Cup. There is a lot of sadness ahead for Harry, so the moment of triumph he feels as the match ends is especially meaningful. I also love the image of McGonagall sobbing over a sporting event.